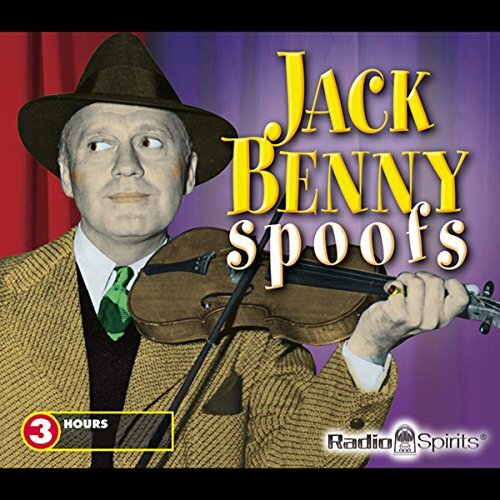 Jack Benny continues to get laughs with this collection of six spoofs that highlight both fairy tales and classic radio shows. This hysterically humorous collection is a must-have for any comedy or Jack Benny fan. A brilliant, talented comic, Benny continues to captivate audiences of all ages with his laugh-out-loud situational comedies and parodies. Digitally restored and remastered, this collection showcases Jack Benny's comedic talents and illustrates why many consider his humor to be legendary. Episodes Include: "Little Red Riding Hood" (12-19-37); "Pinocchio" (03-31-40); "Bob Hope Show Parody" (04-23-44); "The Fiddler" (10-20-46); "Sorry, Wrong Number" (10-17-48); and "Jack and the Bean Stock" (07-25-54). Public Domain (P)2005 cp Radio Spirits, Inc. All audio programming is licensed through series rights holders. All rights reserved. What would have made Jack Benny Spoofs better? Funnier writing. Some Jack Benny programs are full of fun and laughs; these shows are not. There's not much wit here. Has Jack Benny Spoofs turned you off from other books in this genre? Would you be willing to try another one of the narrators?? ?s performances? If you could play editor, what scene or scenes would you have cut from Jack Benny Spoofs? Pretty much all of it. There's little wit, the live audience on the soundtrack doesn't seem to know if and when to laugh. Jack Benny shows vary in quality. These shows are at the lower end. Insults are too direct, gags are cliche'-ridden, there's not too much inspired comedy here.